We’ve already announced four great new features coming in Veeam Backup & Replication v7. And, we’re not done yet! We’re proud to announce the fifth new feature in the Countdown to v7 — Native Tape Support! If you’ve been using Veeam for a while, you know our focus has been on helping customers realize the full potential that virtualization provides for a modern IT infrastructure. Thus far, we’ve not supported writing backup files to tape natively. However, we heard you in the Veeam Forums, on Twitter and at events, and Veeam Backup & Replication v7 delivers Native Tape Support, giving you options for archiving your backups—disk, cloud and tape. If you believe the media, it is. But, based on customer feedback, we know this isn’t true for everyone. Whether dealing with compliance rules, internal policies or if you simply need to archive backups using tape infrastructure you’ve already invested in, these challenges can be solved with our Native Tape Support. Native Tape Support in Veeam Backup & Replication v7 supports virtual tape libraries (VTLs), tape libraries and standalone drives. Working with VTLs, tape libraries and standalone drives is easy with v7. As long as the tape device can be seen in Windows Device Manager, it is automatically picked up by our software. The new tape support brings two types of jobs: Backups to tape and Files to tape. The figure below shows an internal preview of this wizard-driven part of the Veeam Backup & Replication v7 interface. 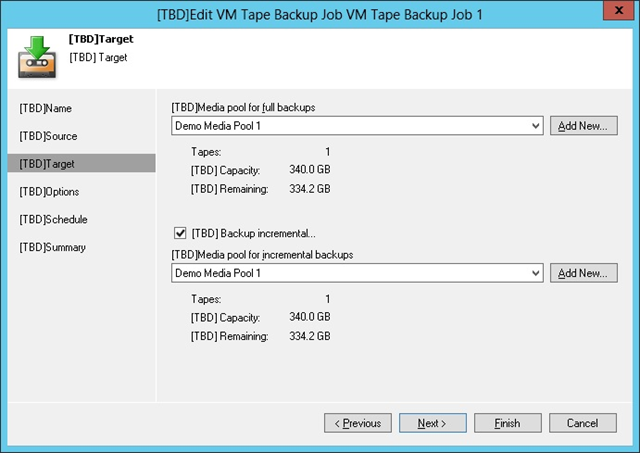 Backups to tape gives you the ability to archive Veeam backups produced by specific jobs to tape, or you can choose to archive entire backup repositories to tape. This means you can have multiple backup jobs in your infrastructure and take those, in a single archive, to tape. Veeam also brings you a convenient scheduling option for backup to tape jobs. This option kicks off the job every time there is a change in the backup files on VM backup jobs. No more scheduling your tape backups—every time you run a VM backup job, the produced backup files are automatically sent to tape. How cool is that! Files to tape gives you an easy-to-use wizard that allows you to add specific files from Windows or Linux servers (virtual or physical) to tape. As long as the server(s) are registered in Backup Infrastructure, you can place any type of file onto tape. We even leverage Microsoft VSS to place files that are locked by running applications to tape in a consistent state. We heard many IT administrators grieving about the loss of NTBackup. Because its replacement, Windows Server Backup (WSB) doesn’t include tape support, many of you are missing needed functionality for your organization. Worry not, because Veeam is bringing this functionality back to you with Veeam Backup Free Edition with tape support for file operations at no cost! 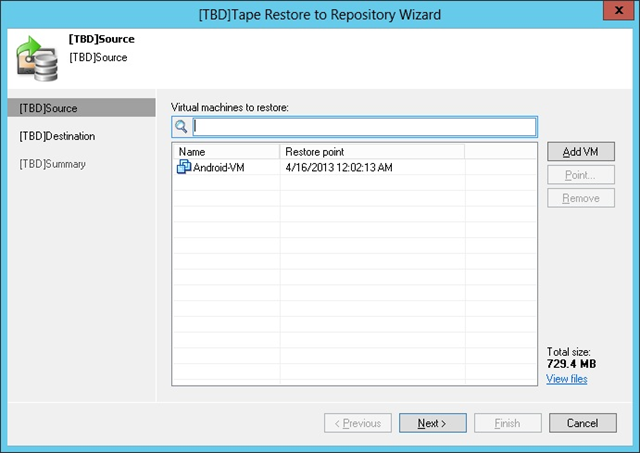 Free Edition even supports restores from tapes created by NTBackup! Restoring backups from tape gives you the same possibilities as when you recover from disk backups. The backups are recovered to one of your repositories, automatically imported, and from there you can use all our great features such as Instant VM Recovery, Veeam Explorer for Microsoft Exchange and other wizards to perform an entire VM restore and more! It is important to note that restores are fully integrated to maintain the VM and recovery point perspective. We are not just tracking backup files on tape—we are tracking VMs and restore points to ensure a seamless restore experience. Just pick the VM and restore point, and our solution will do the rest—figure out what tapes are required, let you to load them if they are not already in the library, and then do the restore. Easy! Instead of thinking about backup file recoveries, you can focus on VMs and recovery points exactly as you do today from disk. The figure below shows an internal preview of the restore wizard. But what if you are scripting guy who hates UI? As always, this feature is PowerShell aware! Restoring files from tape comes with the same ease-of-use you expect from Veeam. Recover data to its original location or to another server. You can also choose to restore file and folder security, and whether you want to overwrite existing files. Below is a short video with a sneak peek of the new Native Tape Support feature.